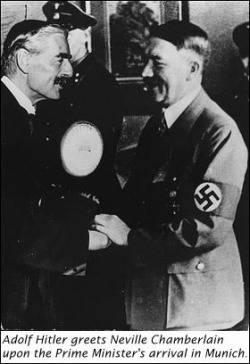 There was a certain amount of trust riding on Hitler, after the agreements of the Munich Conference. Hitler promised that, after taking The Sudetenland, he would not invade Czechoslovakia any more. In his own words, "We have no territorial claims in Europe." The powers of Europe, after having appeased Hitler and Germany by granting them the Sudetenland, trusted Hitler enough to believe that he would keep his word, keeping European peace alive indefinitely. Powers such as Britain and France told Czechoslovakia that, if she wanted to fight against Hitler taking the Sudetenland, she would not have any support. Thus, the Czechs let the Sudeteland go to the Germans, without conflict. After this success, Hitler wanted to test the bounds of the Munich Agreement. Soon after taking the Sudetenland, Hitler pronounced the Munich Agreement 'a scrap of paper' and his troops invaded Czechoslovakia, taking control of the country. Czechoslovakia itself was powerless in stopping the invasion. Meanwhile, the rest of Europe relied upon the League of Nations to stop Hitler's aggressiveness. However, the League was also incapable of doing anything. Hitler therefore had very little resistance in his attempts to bring Czechoslovakia under his control. The Seizure of Czechoslovakia therefore had a muti-faceted approach to the morale of Europe at the time. It proved that Hitler was untrustworthy and powerful, and it proved that the League of Nations, as well as the rest of Europe, was incapable of doing anything to resist Hitler's attempts to take Europe under his control.